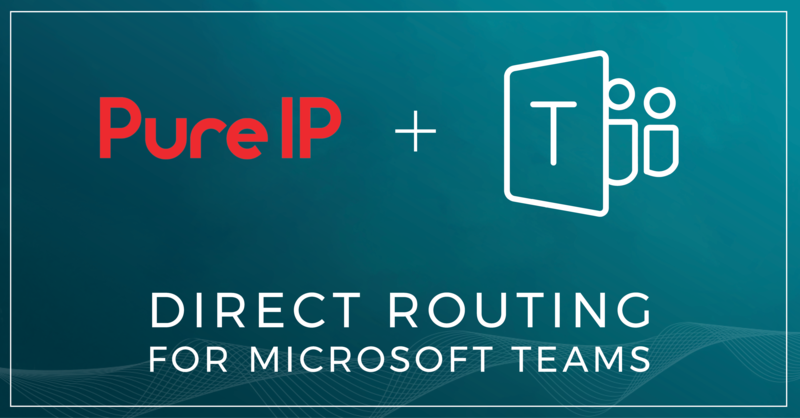 July 12, 2018 -- In Spring 2018, Microsoft announced that the Teams product release will support direct routing using third-party SIP trunk providers, such as Pure IP, to provide reach to international offices and remote locations. Pure IP’s engineering team has worked diligently to be at the forefront of the launch, investing a significant amount of time and resources to design a direct routing solution that seamlessly integrates with Teams to provide an effortless voice communication experience. Pure IP has developed a solution that is agile, flexible, and easily-deployable in any migration environment including: direct transition to Teams, Skype for Business on-premises, Skype for Business Cloud Connector Edition (CCE), and existing hybrid solutions. Pure IP’s Teams direct routing is available in the United States, the United Kingdom, and Australasia via Microsoft-certified Session Border Controllers (SBCs), including Ribbon and AudioCodes devices. The unique solution allows for multiple encrypted and dedicated connections into Office 365 for each individual customer tenant; additionally, Pure IP’s Microsoft direct routing includes fail-over engineering to geo-redundant secondary Session Border Controllers ensuring security and dependability. Pure IP is proud to be a Microsoft Voice Partner since 2010; the company has designed solutions and support for other numerous Microsoft Unified Communications (UC) products including Lync, Skype for Business on-premises, and Skype Cloud Connector Edition (CCE), providing the team with technical expertise and equipment to quickly and easily migrate corporations to the Teams platform. For more information about Pure IP’s Microsoft Teams direct routing solution, please visit out Contact Us page. About Pure IP: Pure IP specializes in unified voice communications and SIP trunking solutions tailored to keep FTSE100 companies, Fortune 500 corporations, and carrier partners connected to their regional and international offices. With coverage in 80+ countries, 600 clients served globally, and one of industry’s largest next-gen technology networks, our engineers are experts in consolidating disparate international sites, reducing complexity, streamlining services, and simplifying telecom infrastructure.